Yoruba legendary movie actor, Moses Olaiya Adejumo a.k.a Baba Sala was born on May 18, 1936 in Ijesha, Osun State. He was a musician, dramatist and comedian. 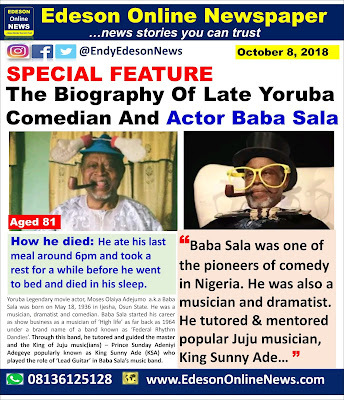 Baba Sala can also be regarded as one of the fathers if not even the grand-father of the modern Nigerian comedians.He always sings in a spectacular way in all his movies. Hardly you will watch any of his movies without singing in it due to his passion for music. 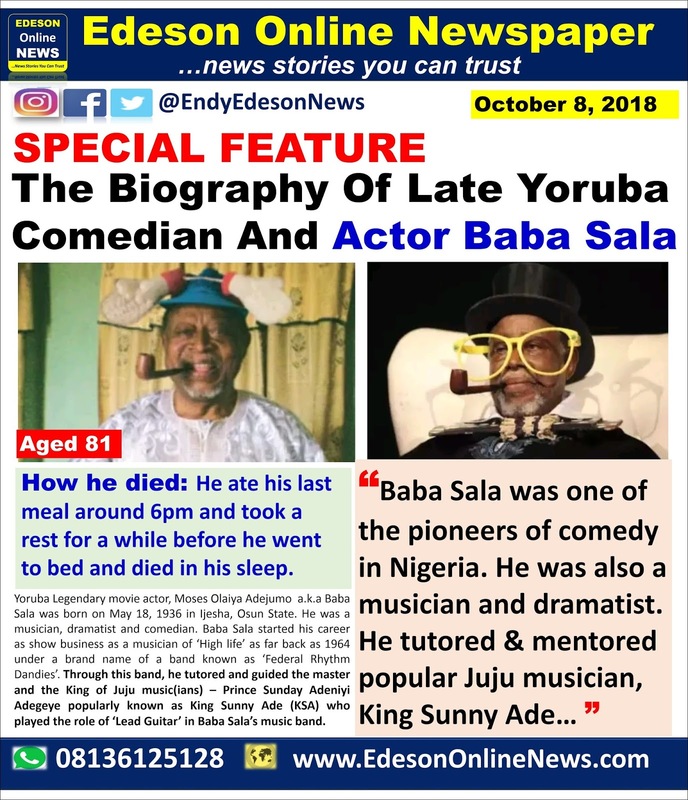 One of the children of the late entertainment icon, Emmanuel has narrated how Baba Sala died and according to him, the foremost comedian died in his sleep after taking his supper. Emmanuel said that his father, Moses Adejumo, ate his last meal around 6pm and took a rest for a while before he went to bed and died in his sleep. He stated that Adejumo’s youngest wife, Funmilayo, went to his room to tell him something when she discovered that Baba Sala had died. For many people who do not know, Baba Sala started his career as show business as a musician of ‘High life’ as far back as 1964 under a brand name of a band known as ‘Federal Rhythm Dandies’. Through this band, he tutored and guided the master and the King of Jujumusic(ians) – Prince Sunday Adeniyi Adegeye popularly known as King Sunny Ade (KSA) whoplayed the role of ‘Lead Guitar’ in Baba Sala’s music band. Yoruba home movies series aired on the then Television Station Of Oyo State (TSOS) later changed to Broadcasting Corporation Of Oyo State (because). Ilesa, Osun State not Ijesha. Ijeshas are people from Ilesa and it's environs. May his good soul rest in perfect peace.